May 18th, 2018 - Maryland rockers CLUTCH have announced Book of Bad Decisions as the title of their new studio album. 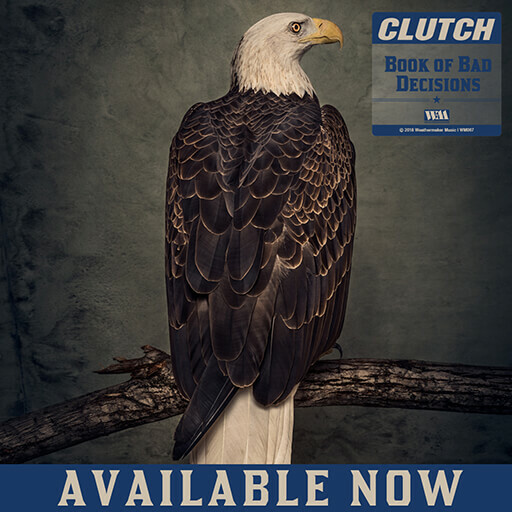 Book of Bad Decisions,CLUTCH’s 12th studio album is scheduled for a worldwide release on September 7th, 2018 via their own Weathermaker Music label. The album was recorded at Sputnik Sound in Nashville, TN by producer Vance Powell (Jack White, Chris Stapleton, The Raconteurs, The Dead Weather) and consists of 15 new tracks. The first single from Book of Bad Decisions is “Gimme the Keys” and will be released today May 18th, 2018. The accompanying lyric video (Vevo | YouTube) was created by David Brodsky. This single is the first of four to be released over the next couple of months as an instant gratification track when pre-ordering the album at iTunes or Amazon.